A bobcat makes an appearance on a trail camera at Six Mile Lake in north Dickinson County. This cat was caught on camera consecutive nights in early March. A different bobcat, this one smaller, on a different trail camera at Six Mile Lake in January. I was at an area business earlier this month buying birdseed when a customer asked the clerk whether they still had a weasel popping up among the stacks of supplies in the store. 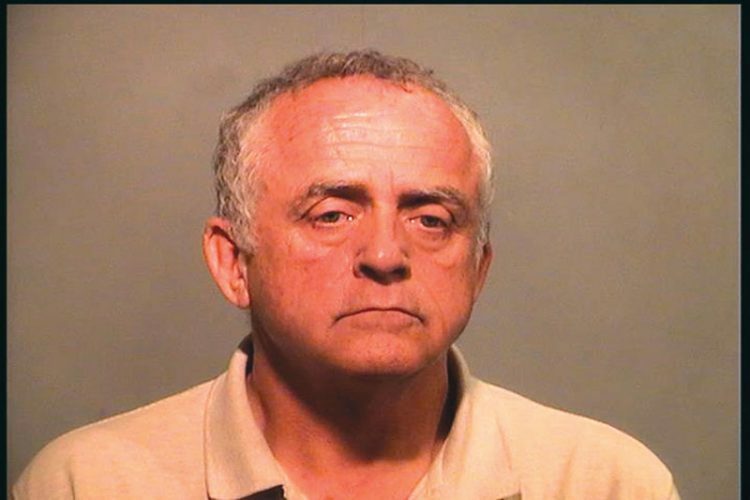 Told yes, he then suggested several ways to catch and evict the animal from the premises. Given what this little predator can do, they might want to instead encourage it to come visit more often. This same place, not surprisingly, has had its share of bags nibbled open by any number of rodents. 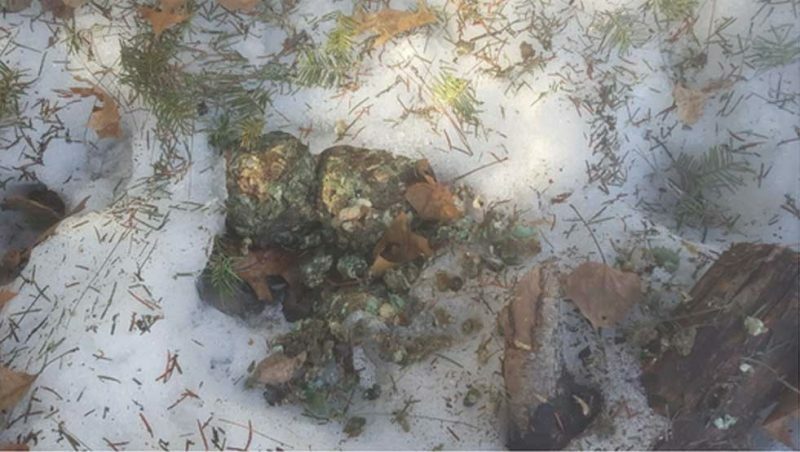 And a weasel can be an effective solution to a rodent problem, said Brian Roell, a wildlife biologist with the Michigan Department of Natural Resources office in Marquette. Michigan’s Upper Peninsula has all three species: long-tailed, the ermine or short-tailed, and the least weasel, well named at only 8 to 9 inches in length, including tail. The long-tailed weasel is the largest and has the widest range of the three in North America, from just above the U.S.-Canadian border south to Central and northern South America, according to the University of Michigan Museum of Zoology website Animal Diversity Web, animaldiversity.org. Their counterparts in Europe and Asia are called stoats, to differentiate them from ermine. 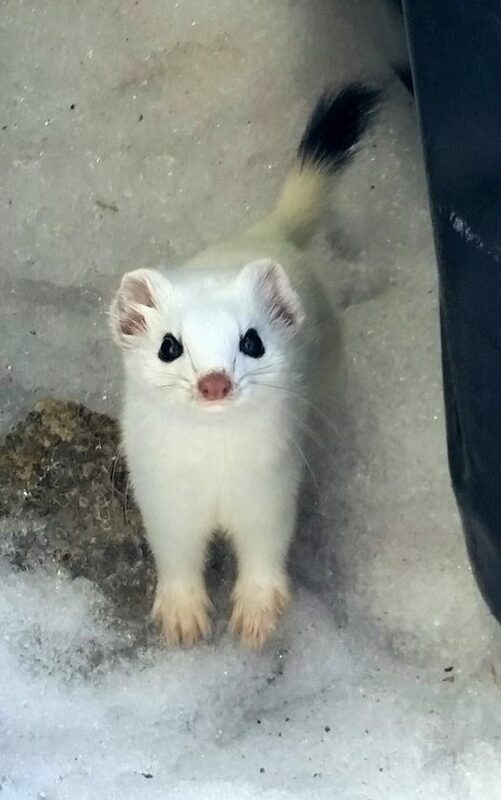 While in this country, ermine has tended to be used to refer to any of the three weasels while in their winter white coats, the medium-sized ermine is its own species. It can most easily be told apart from the long-tailed weasel by the length of tail and its white feet and belly in summer; the long-tailed has more yellow markings than white. The ermine likely is the more common here, the least the rarest, although its size makes it difficult to see, Roell said. But they are not well studied and almost impossible to get a true count of their numbers. The University of Michigan site indicates they are considered relatively common but can have population fluctuations when rodent numbers decline as well. Like others in their extended family — which includes mink, otter, fisher, marten, badgers and the bear-like wolverines — they even have the ability to delay implantation after mating, so a breeding in the summer won’t start developing until March or be born until April and early May. They even can delay pregnancy altogether in really poor years. This is a useful trait for an animal almost constantly hunting. All weasels live life in the fast lane, with a metabolism that rivals hummingbirds and shrews. Fast, agile, built to fit in burrows or narrow openings, they can pursue prey into places that might thwart other predators and strike with a speed that would challenge a snake. But that quickness comes at a cost: weasels must eat a lot to make up for what they burn and they do not pack on fat, so have few reserves if unable to hunt. A European study indicated ermines may consume 20 to 30 percent of their body weight in a day, Roell said. If food dries up or a weasel gets trapped somewhere, it may starve in a matter of days. It’s why weasels will stockpile if they can make extra kills, a tendency that gained them the mistaken reputation as bloodthirsty or killing for sport. While the long-tailed and ermine will take what they can get if the opportunity arises — rabbits, chipmunks, squirrels, birds, even amphibians, reptiles, fish, insects and earthworms — at least half its diet is thought to be the smaller rodents, such as voles and mice, Roell said. Which is why some farmers and homeowners will welcome weasels, as long as they have well-secured chickens or no domestic rabbits that might be at risk. Fierce as weasels might be, dogs and cats have nothing to fear from them, Roell said. Not long after hearing about the weasel at the feed store, I caught sight of one of the cottontail rabbits that live around our home, sprinting into the woods, then realized the dark spot skittering like a bug after it was the black tail tip of a pursuing ermine. The rabbit got away and I have to admit being glad about that. But I also suspect the ermine likely is the reason the spilled seeds in our garden tractor shed have gone uneaten through the winter. 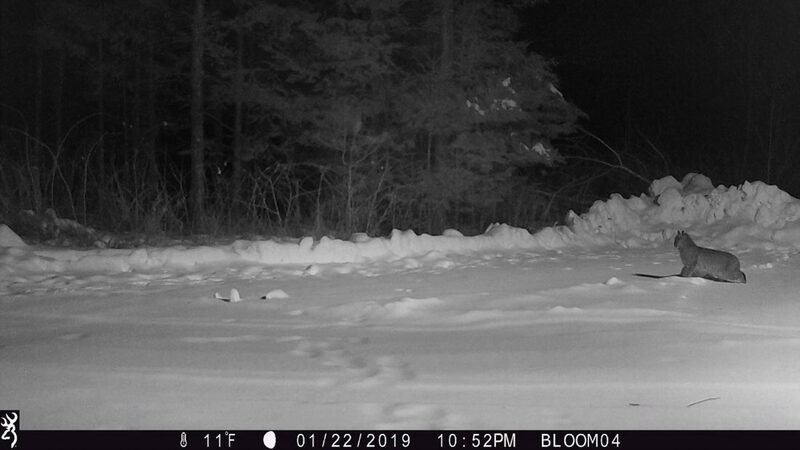 While on the subject of predators, our property also had the first confirmed visits by bobcat, with photos on the trail cameras, the most recent on March 7. Most experts who I shared the photos with thought the second cat was a male, considering the size. The first appeared smaller, perhaps about 2 years old. Late winter is considered normal breeding season for this, the most common wild feline by far in Michigan and Wisconsin. 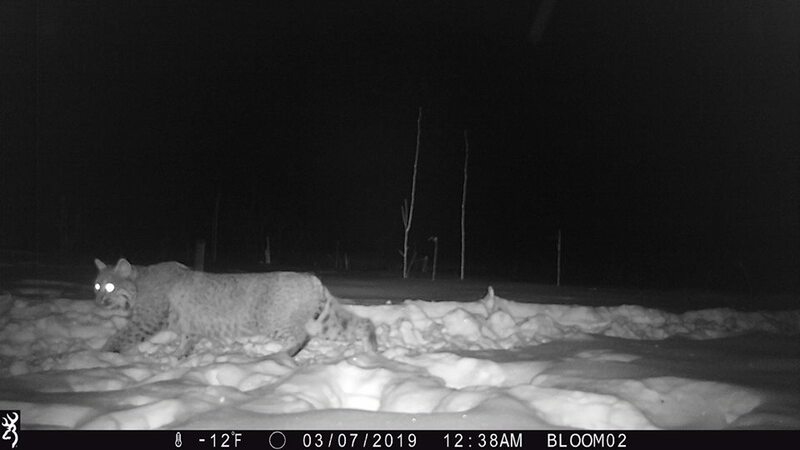 So this cat, which returned on consecutive nights, might have been making the rounds to mark territory and advertise for a mate, maybe even the other bobcat that appeared in January. Bobcats are an elusive species so it’s difficult to study or gauge the overall population, Roell said. But it’s far below coyote numbers, so while they are “very effective at what they do and kill at a greater rate,” the overall effect they have on prey populations pales in comparison, Roell said. I also got a couple of comments about worrying about pets around a bobcat. Considering they can be hunted with dogs, barking likely is enough to scare them off, Roell said. Just a note that conditions today — potential temperatures in the 50s, sunny, a southwest wind — should carry a host of early migrating bird species back into the Upper Peninsula. Some will use the opportunity to move out as well. 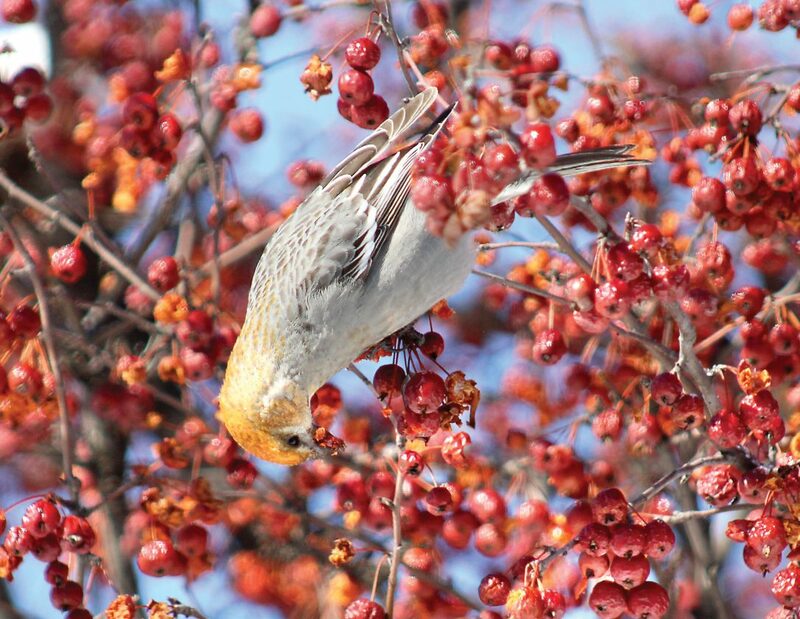 The pine grosbeaks that had been regularly seen in the fruit trees along the road that cuts through Chapin pit in Iron Mountain likely will be absent from here on out, if not gone already.